Fans of choral music in Westmen will get a rare treat on Monday as the Brandon University (BU) Choral Ensembles host the North Dakota State University (NDSU) choirs in a concert event entitled Share the Music! Under the direction of Dr. Jo Ann Miller and Dr. Eric Saari, the NDSU Concert Choir and Madrigal Singers will feature dynamic choral works by composers John Corigliano and Edwin Fissinger as well as Saari, an NDSU graduate who premieres new songs based on three poems by Emily Dickinson. The BU Chorale and Concert Choir will perform works by Britten, Esenvalds and Piazzola. The last piece of the concert will feature the combined four choirs performing the Sanctus excerpt from the Requiem by Gabriel Fauré. “This is the first time since I arrived at BU in 2000 that we have hosted a university choir from the United States,” said Dr. Andrée Dagenais, director of the BU Chorale. The concert will take place at Knox United Church on Monday at 7:30 p.m., with a silver collection at the door. The NDSU Concert Choir has performed at state, regional and national music conferences, including eight North Central American Choral Directors Association conferences and the association’s national conference in San Antonio, Tex. The choir visited Eastern and Central Europe in 2009, toured Croatia and Italy in 2012, and Iceland and Scotland in 2015. The choir received the first place gold medal at the International Choral Competition in Zadar, Croatia, during the 2012 tour. They are currently on a tour that features performances in Grafton, N.D., Langdon N.D., and Grand Forks N.D., as well as Brandon and Winnipeg. In addition to having been the guests of the Winnipeg New Music Festival, BU Chorale and BU Concert recently performed Messiah and Copland’s Hymn to Freedom with the Winnipeg Symphony Orchestra. 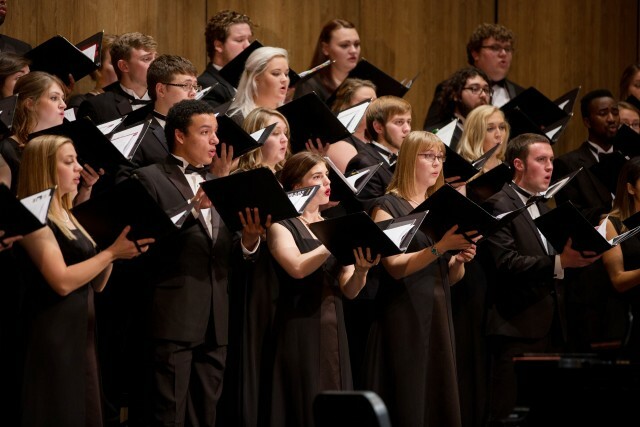 Recent tours of BU Chorale include the Northwestern Ontario in 2015, the Baltic countries in 2014, and Cuba in 2010.